Amigurumi Technique That Will Change The Way You Crochet Forever! Are you a Lifter, Rider or a Yanker? I have been trying to explain to my sister in law, who also crochets, why our gauges seldom match. I have carpal tunnel, so I have always said that I crochet loosely to compensate. My sister in law, crochets tightly. I had thought that’s just what it was, she must clutch her yarn ridiculously tight to get that stitch that tight! Lately, we’ve become more comparable in our gauge swatches. That is because I’ve begun to do amigurumi and I’ve changed the technique that I have been using to complete stitches. Getting the stitches tight enough so that the stuffing did not show through for me has been a struggle, but the reason I started crocheting is because I was intrigued by amigurumi. Call me a weirdo, but I want to crochet eggs and bacon and toast on a plate. What am I going to use it for?? I have no earthly idea, but it’s interesting to me lol Only to find once I started crocheting that it was impossible for me! One day though, it just clicked! My stitches didn’t need to become tighter. No matter what I did using the same technique, it was going to be the same, just tighter, and my hands were going to ache because I was doing it wrong. By changing my technique, I was able to perfect amigurumi and my hands never ached. Most amigurumi are done using single crochet. After putting your hook through the next stitch in your row, yarning over and pulling through, you will have two loops on your hook. 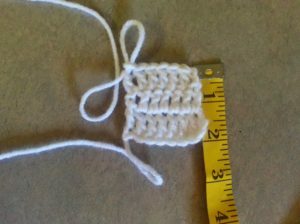 Those loops get tighter or more loose depending on the way you complete your next yarn over and pull through to complete the single crochet stitch. Here’s what I noticed that I did incorrectly after my first yarn over and pull through of the single crochet stitch: When I crochet normally, the loop at the front of my hook, closer to the hook, somehow got to be double the size of the other loop, which made my STITCHES too large. I have learned recently that this is called being a “lifter” and that I was lifting the front loop up to be the same height as the back loop. When doing amis, once the stitch was completed, I would then yank on my tension yarn to make my tension tighter to accommodate for crocheting loosely. Or, what I thought at the time was crocheting loosely. Which made me a lifter AND a what is called a “yanker”! It’s not that I crocheted any more loosely than my sister in law. It’s just that I made my stitches differently. Tension had little to nothing to do with it. The trick to making an amigurumi successfully is: If you tilt your hook up at the back end instead of pulling straight to the side, when completing the last yarn over and pull through of your single crochet stitch, those loops left on the hook never get any bigger. This is called riding the stitch. Those that are “riders” don’t have any more undue stress on their hands than lifters do, which is what I desperately needed to avoid, having carpal tunnel. And they also are able to match gauge more closely than someone who is a lifter or a yanker, like me. However, you can also do your stitches too close to the stitches below them, by holding your tension TOO tightly, or yanking on the tension yarn to get your tension as tight as you think it has to be, which is what I found that I did when trying to crochet more tightly. And then any stitch in subsequent rounds is going to be a terror on your hands trying to get the hook and yarn through. Your yarn’s going to snag… and the stuffing still will show through because you’ve crocheted so tightly. If you’re having trouble putting your hook into the stitch below it might be indicative that you are yanking on your tension yarn. If you’re like me then you don’t even know you do this. I thought I had an “a-ha” moment that no one had had before. I didn’t realize there were names for the different techniques for completing the stitches, I just knew that in order to complete an ami correctly I had to tilt up my hook at the end when completing my stitch so as to keep the two loops the same size and that if I DID this, I would then not feel the need to yank on my tension yarn to get it tight enough to start my next stitch. This has slowly moved over into my other non-ami projects and has changed the way that I crochet forever. I hope it has for you as well! Below is a video from Crochet Ever After that has helped me to visualize the different stitch techniques. She also tells you how to change these habits.